1.2 What is fenugreek good for? 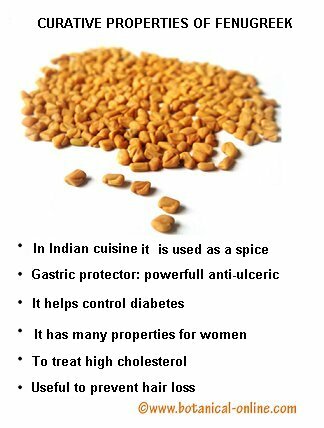 1.3 What are fenugreek benefits in diabetes? 1.6 How to take Fenugreek for diabetes? Fenugreek (Trigonella foenum-graecum) is a small and yellow seed used as seasoning in Indian cuisine and North Africa mainly. This seed, full of medicinal components, has been widely studied for its therapeutic effects. Among other properties, it is hypoglycemic, helps control cholesterol and obesity, stimulates lactation and may relieve symptoms of menopause. Currently, its effect to control Type 1 and 2 Diabetes is one of the most interesting fields of study or fenugreek. Indeed, this supplement has proven properties to reduce blood sugar. The hypoglycemic activity was observed in numerous clinical studies both in animals and in people with diabetes mellitus type I and II. What are fenugreek benefits in diabetes? – It reduces blood sugar levels: thanks to fiber, 4-hydroxy-isoleucine, trigonelline and fenugrecin fenugreek has hypoglycemic effect. However, fenugreek may cause unwanted side effects if the dose is not adjusted properly with antidiabetic medication regimens. Therefore, medical supervision is essential in these cases. – It prevents obesity when taken regularly in the diet or in supplement, thanks to its natural composition rich in soluble fiber and mucin. – It prevents cholesterol and increases HDL cholesterol. – Eye Health: Fenugreek contains the flavonoid rutin, which helps to improve eye health and prevent eye diseases. The mechanism of action of fenugreek in relation with diabetes is sue to the high fiber content of seed mucilage, alkaloids and amino acids. Soluble fiber, especially glucomannan fiber, delays intestinal absorption of ingested sugar, directly affecting lower post prandial glucose levels (after eating) . Fenugrecin and trigonellin: components with hypoglycemic action proven in numerous clinical studies. 4hydroxy isoleucine amino acid that acts on the pancreas to increase the release of insulin, the hormone that regulates glucose levels in the blood. This effect occurs in the islets of Langerhans (they release insulin). Fenugreek also contain vitamin E (as carotenes), which in dosages of 0.61.2 grams per day can prevent complications associated with diabetes. For example, it has been observed that this supplement helps to reduce cholesterol in these patients. Fenugreek has a number of contraindications. Do not take fenugreek if you are on medication or are taking contraceptives. If you are diabetic, you can only follow this supplementation under medical supervision. How to take Fenugreek for diabetes? Hydroalcoholic extract from seeds: 1 g per day of standardized extract. To treat diabetes. Fenugreek supplements: take from 2.5 to 15g of Fenugreek a day. Start at low dose and increase if the advice of your doctor. This type of supplement is available in pharmacies. The can be done at home if you have spice beans. To prepare, buy empty capsules at the pharmacy and fill them with crushed fenugreek seeds. Effective in treating diabetes, obesity and hypercholesterolemia. Aromatic spice: grind the seeds and introduce an eating plan for Diabetes: sauces, salads, soups. Between 2 and 3 grams are enough to notice the health effects. Up to 15g. of seeds per day. Effective in treating diabetes, obesity and hypercholesterolemia. – Ali L, Azad Khan AK, Hassan Z, Mosihuzzaman M, Nahar N, Nasreen T, Nur-e-Alam M, Rokeya B. Characterization of the hypoglycemic effects of Trigonella foenum graecum seed. Published: Planta Med. 1995 Aug;61(4):358-60. Available in Medline. – Baquer NZ, Kumar P, Taha A, Kale RK, Cowsik SM, McLean P. Metabolic and molecular action of Trigonella foenum-graecum (fenugreek) and trace metals in experimental diabetic tissues.School of Life Sciences, Jawaharlal Nehru University, New Delhi 110067, India. Published in: J Biosci. 2011 Jun, 36 (2):383-96. Available in Medline. – Xue WL, Li XS, Zhang J, Liu YH, Wang ZL, Zhang RJ. Effect of Trigonella foenum-graecum (fenugreek) extract on blood glucose, blood lipid and hemorheological properties in streptozotocin-induced diabetic rats. Department of Public Health, School of Medicine, Xi’an Jiaotong University, 76 West Yanta Road, Xi’an, Shaanxi, China 710061. Posted in: Asia Pac J Clin Nutr. 2007, 16 Suppl 1:422-6. Available in Medline. – Gupta A, Gupta R, Lal B. Effect of Trigonella foenum-graecum (fenugreek) seeds on glycaemic control and insulin resistance in type 2 diabetes mellitus: a double blind placebo controlled study. Jaipur Diabetes and Research Centre, India. Published in: J Assoc Physicians India. 2001 Nov;49:1057-61. Available in Medline. – Chevassus H, Gaillard JB, Farret A, Costa F, Gabillaud I, Mas E, Dupuy AM, Michel F, Cantié C, Renard E, Galtier F, Petit P. A fenugreek seed extract selectively reduces spontaneous fat intake in overweight subjects. Clinical Research Center, Centre Hospitalier Universitaire Régional de Montpellier, Montpellier, France. Published in: Eur J Clin Pharmacol. 2010 May, 66 (5):449-55. Available in Medline. – Hannan JM, Ali L, Rokeya B, Khaleque J, Akhter M, Flatt PR, Abdel-Wahab YH. Soluble dietary fibre fraction of Trigonella foenum-graecum (fenugreek) seed improves glucose homeostasis in animal models of type 1 and type 2 diabetes by delaying carbohydrate digestion and absorption, and enhancing insulin action.School of Biomedical Sciences, University of Ulster, Coleraine, Northern Ireland, UK. Published in: Br J Nutr. 2007 Mar, 97 (3):514-21. Available in Medline. – Kumar P, Kale RK, McLean P, Baquer NZ. Antidiabetic and neuroprotective effects of Trigonella foenum-graecum seed powder in diabetic rat brain. School of Life Sciences, Jawaharlal Nehru University, New Delhi, India. Published in: Prague Med Rep. 2012, 113 (1):33-43. Available in Medline.